Nestled between the sea and the mountains, Gaspésie is an immense, iconic region of Québec that offers a multitude of activities year-round. A change of scenery, maritime heritage, nature walks, sea excursions, Northern gannet, caribou and whales await—to say nothing of the legendary Gaspesian hospitality, Percé rock and fresh lobster! The cities of Matane and Gaspé sit respectively 400 km and 700 km from Québec City. Route 132 runs right around the peninsula. Two ferries, Baie-Comeau–Matane and Godbout-Matane, link the Côte-Nord to the Gaspésie region. VIA Rail also runs between Montréal and Matapédia, a village close to Campbellton, the gateway for visitors from New Brunswick. The Gaspésie region is Québec’s ultimate sea and mountain destination. Paddle down clear, turquoise-flecked rivers or out to sea to watch the sunset with the seals. Dive into caves or go underground to explore the deepest grottos in Québec. Take to the seas to go whale watching, observe the most accessible colony of Northern gannets in the world or catch your own lobster. Soar in a hang glider, go canyoning or climb the second-highest summit in Québec. See moose, bears and the only herd of caribou south of the St. Lawrence River. Simply put, Gaspésie is over 30,000 km2 (11,500 mi2) of playground, 722 km (450 mi.) of coastline, towering mountains reaching over 1,000 metres (3,280 ft.) in height, more than 1,000 km (620 mi.) of walking trails and endless activities to enjoy, all four seasons of the year! Gaspésie’s GRA1 is the only trail in North America to receive the GR® (Grande Randonnée) designation from France’s Fédération française de la randonnée pédestre. The trail is 650 km (405 mi.) long and links Pointe de Forillon to Matapédia through the Chic-Chocs mountains, offering up to 40 days of backpacking! The well-known Lonely Planet travel guide has named the Tour de la Gaspésie (Gaspésie Tour) as one of the top five coastal road trips in the world. The tour starts in Sainte‑Flavie and forms an 885‑km (550‑mi.) loop. Following the coast for almost its entire length, it then cuts through the Matapédia Valley. In its centre, mountains—including the Chic-Chocs—lakes and rivers form an immense outdoor playground. Whether you take this route from the north or the south, its spellbinding views are unlike any other. More than a road trip, the Tour de la Gaspésie is an experience you can make your own, by stopping at any number of the varied attractions that pique your interest. So, the only question is, when will you go on your tour? It was only in 1929 that the road encircling the Gaspésie peninsula was completed. Before then, certain coastal villages were accessible only by boat. That same year, a tourism brochure titled Romantic Quebec: Gaspé Peninsula was published, and the mythical Tour de la Gaspésie (Gaspésie Tour) was born. 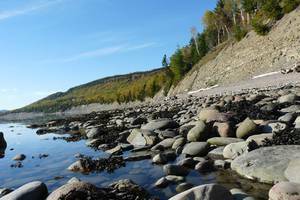 The Gaspésie region is teeming with hidden treasures to discover! Are you a fan of via ferrata? Descend underground and explore the Spéos de la Fée, the deepest cave in the province, by means of the only subterranean via ferrata in Québec! Or try canyoning, an exhilarating activity that involves travelling waterways, following ravines, crossing gorges, as well as jumping and gliding through clear waterfalls. Embark on a fishing expedition in the high seas with professionals and pull up crab and lobster crates, or discover hidden underwater marvels by trying deep-sea diving for the first time! You’ll be treated to impressive coral reefs, a wide variety of fishes, and seals in the Gulf! In need of a good rest? Sleep in a floating yurt, surrounded by water. Breathtaking views of the Baie des Chaleurs are guaranteed! Out from Percé lies one of the most spectacular diving sites in Québec. The underwater world of crabs, sea urchins, starfish, jellyfish, caves and vestiges of drowned vessels will amaze you. To top it off, the region offers outstanding diving conditions… and curious seals who just want to play! Winter sport enthusiasts need look no further for snow! 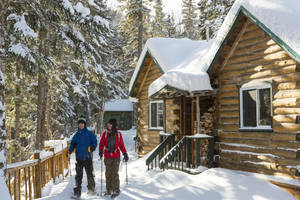 With an annual snowfall of over 7 metres (23 ft.), Gaspésie is THE destination for living winter to the fullest. Gaspésie is a snowmobiling hotspot, with over 3,000 km (1,865 mi.) of groomed trails, standardized signage and numerous amenities all along the way. With its captivating views of the sea and mountains and its snow-covered Percé rock, Gaspésie is the stuff of dreams. Those who love snowshoeing, cross-country skiing and telemarking will also be thrilled by the vast open spaces in which to play. And did we mention that Gaspésie has the best backcountry skiing in eastern North America? Winter in Gaspésie is all about striking vistas, comfort food, a warm welcome and, above all, loads of fresh powder to savour winter in all its glory. You can go heliskiing in Gaspésie. A chartered helicopter will take to you Mont York, which offers an unequalled, exclusive-access playground with 30 ski jumps, as well as Mont Porphyre, where the views are mesmerizing.